Injured HPD officer speaks about his recovery, Kevin Quinn reports. HOUSTON (KTRK) -- Weeks after he was shot multiple times in the line of duty, Officer Ronny Cortez is optimistic on his ability to walk again. "(It) shattered my vertebrae and punctured my spine," said Cortez. Cortez said the bullet remains lodged near his spine. It's too dangerous to remove it. The 24-year HPD veteran was critically wounded in February while attempting to capture a burglary suspect in the 8700 block of Sterlingame. He was wounded despite wearing a bulletproof tactical vest. The wound has left him paralyzed, he said, from the chest down -- for now. "This right here is just gonna be a temporary thing, something I've just got to work through," said Cortez. He is thankful that he can talk, breathe and get better. 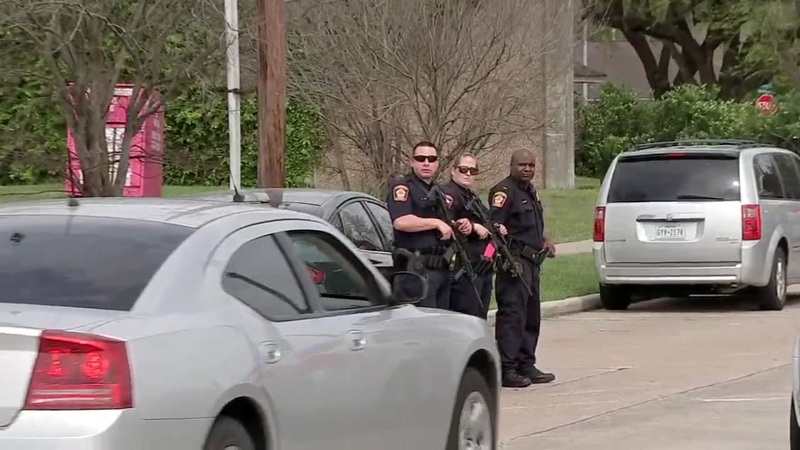 Officer Ronny Cortez was one of two Houston Police Department officers injured in a pursuit involving burglary suspects in southwest Houston on Tuesday. Here's what we know about him. Cortez and Officer Jose Munoz were both shot as they scuffled with the gunman. Cortez said they had placed handcuffs on one of the suspect's hands, but hadn't secured the other when that man broke free and opened fire. He describes feeling numb, knowing immediately he'd lost movement in his legs. "I was telling them: Don't tell my wife, don't tell my wife," he said. Earl Donell Riley, 25, was killed when Munoz returned fire. Riley had been out of custody that day after convictions for at least 10 felony offenses, some of which were violent. "He was continually let out. Over, and over, and over. Deal after deal, after deal -- that led to this," said Cortez's wife Sheri. The couple is hoping to get laws and policies changed to ensure more time behind bars for repeat and violent offenders. "We have to put a stop to this - letting these violent offenders out," she said. Cortez is hoping to leave TIRR Memorial Hermann hospital late next month. He plans to walk out upon his release. Officer Munoz is already home recovering. A BBQ fundraiser is set up for Saturday in north Houston to help raise money for families of both wounded officers. The fundraiser is located at The Concert Pub North at 2470 Cypress Creek Parkway and will last from 11 a.m. to 5 p.m.